When your turn begins, you may remove 1 card in the heap from the game. If you do, gain 2credit. "Talk is free. Anything else is going to cost you." Can the Runner trash a card with Aesop's Pawnshop and then remove that same card from the heap with Bloo Moose? Yes. Both Aesop's Pawnshop and Bloo Moose meet their trigger conditions at the same time, so the Runner can choose the order in which the abilities trigger. What if I told you that every extra copy of that unique card or console that you play to keep your deck consistent was no longer a dead draw, but was 2? What if each Sure Gamble netted you 6 instead of 4, and each Daily Casts was 7 instead of 5? What if, every time you pawned something, you made 5 instead of 3? What if I told you that all this was yours throughout the game for one and 4, and the 'combo piece' doesn't need to go down first? I think that this card is really good. Potentially Most Wanted List good, but it's too early to say. Criminal loves this, they rarely recur anything anyway. Anarch loves this, particularly punk rockers. Even Shaper loves this to filter their next Levy AR Lab Access for maximum effectiveness. I'm predicting this card will find a home in many, many decks. Immolation Script is a really fun card! Doesn't work against some decks -at all- though. This makes it an unattractive choice, in competitive circumstances especially. That makes the choice to take three copies and have consistency (instead of the card in question being a weird singleton "flex slot" forever) even less desirable. A lot of cards fit this in this category. "Not bad but not good enough." "A little too janky." "Weird combo piece." Call it whatever you want. We all know of the category well and have our own opinions on what cards fit there. Either way, we can all agree on one thing: we desperately want to use these cards. Welcome to the location of a lifetime. Every single card in your deck is worth 2 credits minimum now. That includes the good and the "Mmmmmaybe..." Yes, the cost up front is 4 and that isn't cheap (but it can be), but it makes that money back in two turns, clickless. 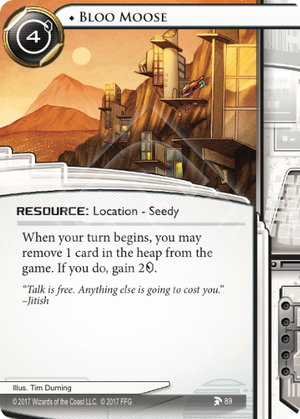 Oh right, the ridiculous amount of credits you get from this card is all clickless. With all this on the table, cards that just looked fun can now look a bit more serious too, and that's an exciting. Maybe worrying too, we'll have to see. Shapers love the Moose and Levy AR Lab Access, as the longer the game goes the more they can prune the heap of everything but their best, most important cards. People used to joke that Criminal heaps might as well have been on Mars with how accessible they were. Jokes on us, turns out it was the whole time and Crims have an amazing sustained economy option that can be added to almost any Crim deck and make it better, full stop. Every Anarch ID and card is laughing their butts off at the ridiculous opportunities that have suddenly blossomed. The three mini-factions love it too--Oh, excuse me, some runners aren't allowed to recycle responsibly. Humanoids love the Moose though. Whatever ridiculous jank, or pet card project, or juuuuuust not competitive enough deck idea you could think of suddenly became at least a teensy bit more viable. There is no such thing as a truly dead draw anymore. p.s. Careful runners, they will try to destroy it. Maybe hold onto a copy, just to be careful. Not a very complicated card. Pay 4 to install and from the next turn onward you can remove a card in the heap from the game for 2. Obviously this is not great if you still need those cards but the effect is optional. Since it takes at least 2 turns to get the install cost out of Bloo Moose this is not a card you can put in any deck. You do need to generate enough trash. MaxX fills up the heap very quickly and Bloo Moose can turn cards that won't be useful against your current opponent into credits. Ken and criminals with lots of run events obviously get cards in heap. Of course you'd want to reuse those events but if you can't turning them into credits is a nice alternative. Geist trashes even more quickly. Same deal as with Ken, it's a nice consolation price. Shapers of all sorts that use Aesop's Pawnshop for money can double up with Bloo Moose for a whopping 5 per previously installed card. Given enough cheaply installed cards that starts to sound like an engine, especially for Hayley. A noteworthy interaction is Populist Rally. That's not a great card but if can reliably install Bloo Moose at least you have the option to play Populist Rally. And played at the right time it can generate a window of opportunity. While I don't think Bloo Moose will pull its weight in any or even most decks it is a useful addition to decks that can afford to feed it.